We are a leading Manufacturer of co- axial profile projectors, horizontal profile projectors, vertical profile projectors, benchtop profile projector, profile projectors and shadowgraph profile projector from Ambala, India. 1 SCREEN Opaque glass screen with 90° cross line fitted with graduated rotary ring(360°) operated by knob, L.C. 1min. 1 SCREEN Opaque glass screen with 90° cross line Fitted with graduated rotary ring (0-360°) operated by knob, L.C. 1min. 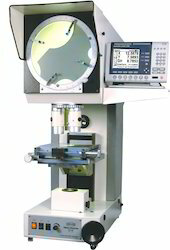 7 LINEAR MEASUREMENT Built-in Glass Scale with D.R.O.